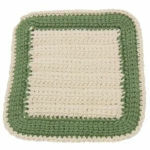 Ric Rac Potholder -- A free Crochet pattern from Julie A Bolduc. This potholder is made in 2 parts, the front and the back. They are made exactly the same then stitched together with the basic sc around the edge. It can also be made in to a hot pad or trivet by just inserting an old CD just before closing up the edges.